Grind off failed epoxy from previous installation. Patch all holes and cracks in the concrete floors. Grind clean ready for polishing. 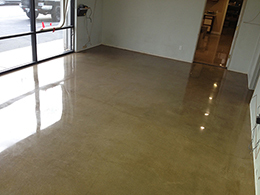 Polish concrete 9 steps to a high gloss finish.